When nothing existed at all, neither heaven nor earth, the great god Zurvan alone existed, whose name means ‘fate’ or ‘fortune’. He offered sacrifice for a thousand years that perchance he might have a son who should be called Ohrmazd and who would create heaven and earth. At the end of this period of a thousand years he began to ponder and said to himself: ‘What use is this sacrifice that I am offering, and will I really have a son called Ohrmazd, or am I taking all this trouble in vain?’ And no sooner had this thought occurred to him then both Ohrmazd and Ahriman were conceived -Ohrmazd because of the sacrifice he had offered, and Ahriman because of his doubt. When he realized that there were two sons in the womb, he made a vow saying: ‘Whichever of the two shall come to me first, him will I make king.’ Ohrmazd was apprised of his father’s thought and revealed it to Ahriman. When Ahriman heard this, he ripped the womb open, emerged, and advanced towards his father. Zurvan, seeing him, asked him: ‘Who art thou?’ And he replied: ‘I am thy son, Ohrmazd.’ And Zurvan said: ‘My son is light and fragrant, but thou art dark and stinking.’ And he wept most bitterly. And as they were talking together, Ohrmazd was born in his turn, light and fragrant; and Zurvan, seeing him, knew that it was his son Ohrmazd for whom he had offered sacrifice. Talking the barsom twigs he held in his hands with which he had been sacrificing, he gave them to Ohrmazd and said: ‘Up till now it is I who have offered thee sacrifice; from now on shalt thou sacrifice to me.’ But even as Zurvan handed the sacrificial twigs to Ohrmazd, Ahriman drew near and said to him :’Didst thou not vow that whichever of the sons should come to thee first, to him wouldst thou give the kingdom?’ And Zurvan said to him: ‘O false and wicked one, the kingdom shall be granted thee for nine thousand years, but Ohrmazd have I made a king above thee, and after nine thousand years he will reign and will do everything according to his good pleasure.’ And Ohrmazd created the heavens and the earth and all things that are beautiful and good; but Ahriman created the demons and all that is evil and perverse. Ohrmazd created riches, Ahriman poverty. In some lineages of Hinduism, Purusha (Sanskrit puruṣa, पुरुष “man, cosmic man”, in Sutra literature also called puṃs “man”) is the “Self” which pervades the universe. The Vedic divinities are interpretations of the many facets of Purusha. According to the Rigvedic Purusha sukta, Purusha was dismembered by the devas—his mind is the Moon, his eyes are the Sun, and his breath is the wind. In the Rigveda, Purusha is described as a primeval giant that is sacrificed by the gods (see Purushamedha) and from whose body the world and the varnas (classes) are built. He is described as having a thousand heads and a thousand feet. He emanated Viraj, the female creative principle, from which he is reborn in turn after the world was made out of his parts. Bhagavata Purana describes that Purusha is the first form of Supreme Lord Narayan and this Purusha is the source of everything in the universe. The Purusha in the title of Purusha Sukta refers to the Parama Purusha, Purushottama, Vedic Supreme God Narayana, in his form as the Viraat Purusha (Enormously Huge Being). It describes this form of his as having countless heads, eyes and legs manifested everywhere, and beyond the scope of any limited method of comprehension. All creation is but a fourth part of him. The rest is unmanifested. He is the source of all creation. Purusha along with Prakrti creates the necessary tattvas for the creation of universe. Watch a video or read the story of the history of the Universe. Purusha is a being of 1,000 heads,1,000 eyes, and 1,000 feet. It is the essence of the Universe. 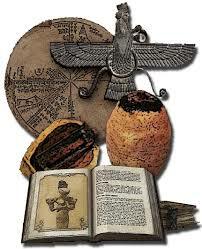 The other name of this essence is Khwaskhwarrik, the “mother” of the twin sons, Hormazd and Ahriman. From this a light of consciousness sparked into the universe known as Zurvan, the beginning of Time. The Infinite became Finite because of Zurvan’s existence. Zurvan had an overwhelming need to have a son named Hormazd. Through this need, Zurvan began to sacrifice the essence,Purusha. Through a 1,000 sacrifices, the Daevas were created, and Zurvan was unaware. During these thousands sacrifices Zurvan began to build doubt. This was the self-conscious doubt that all his effort was in vain because there was no sign of change. way out, my chances were slim. The lesson of creating my own was learned before birth.I hold Arch-Daeva Nanshait above all others. This is why. Then I moved about, bouncing off everything to find a way out, of my own mother. There was no way! I became desperate, I wanted to appease and attain favor! The walls felt pliable, so I grabbed and clawed at them. Shuttering began, other noises followed and I attained a greater focus and determination than I ever did; a joy of triumph. favor and kingdom?” asked Nanshait. So I ended up in some dark recesses of the universe. It seemed to me, as I tore my way out, the husk that I was in exploded. All the pieces turned into what is known as stars, planets, and galaxies. Enraged, I moved toward a planet. I held it between my hands. Then I crushed it. This entry was posted in Church of Ahriman, Occult, Zoroastrianism and tagged Adam B Daniels, Ahriman, Angra Mainyu, Bible of Corruption, Church of Ahriman, Dastur Adam Daniels, Vedic Hinduism, Zoroastrianism. Bookmark the permalink. Great goods from you, man. I’ve understand your stuff previous to and you are just extremely fantastic. I really like what you’ve acquired here, certainly like what you are saying and the way in which you say it. You make it enjoyable and you still care for to keep it sensible. I can not wait to read far more from you. This is really a terrific website.